(Culver City, CA – May 14, 2014)— Renowned art book publisher of TASCHEN, Benedikt Taschen, has made a generous half a million dollar donation to the Wende Museum’s transformation of the former National Guard Armory in Culver City, California with the view to creating an international center for the exploration and preservation of Cold War culture, art, design and history. Mr. Taschen, who has made his reputation as a “cultural archeologist” and supporter of the arts, is guiding the adaptive reuse of the historical Cold War structure and will host an opening gala together with the Consulate General of the Federal Republic of Germany in November 2014 to celebrate the first phase of the building’s renovation, supported by a $5 million challenge grant from the London-based Arcadia Fund. The Wende Museum was founded in 2002 by historian Dr. Justinian Jampol to preserve the material culture of East Germany, Eastern Europe and the Soviet Union during the Cold War. 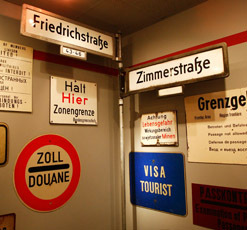 The museum houses a multitude of paraphernalia from the period including remnants of Checkpoint Charlie, the longest stretch of the Berlin Wall in the USA, a ten-foot bronze sculpture of Lenin by the Russian artist Pavel Bondarenko, extensive surveillance equipment and the personal papers and prison transcript of the notorious East German leader, Erich Honecker. The Wende’s 75-year lease of the Culver City-owned Armory—a 1950s modernist structure—will feature 15,000 square feet of storage and exhibition space on the one-acre property. “Our new home at the Armory will make the collections accessible to the public and enhance the Wende’s role as a center for cultural discovery,” said Jampol. “The Wende collection is unparalleled and it is a great pleasure to help give the collection the international awareness it deserves," says Benedikt Taschen, who will also publish a 900-page book on The Wende’s East German collections to coincide with the opening of the Armory building and the 25th anniversary of the fall of the Berlin Wall.